For serious photographers, whenever we turn our attention toward small cameras, we want to know if we are able to do serious work with them. We all know that even a plastic toy camera can produce stunning art, but that is not what we mean. We want a camera that is responsive, flexible and has sufficient image quality—so that small size is an advantage, not a compromise. Many of us T.O.P. readers have been excited about the prospects of a Decisive Moment Digital (DMD) camera—a small carry around camera that is responsive and has image quality near that of current DSLRs. As each new potential DMD is announced, excitement builds. My excitement about the Canon G10 was tempered by my belief that only a larger sensor could give me the kind of image quality that I seek, and I knew the sensor in the G10 was still small (1/1.7- inch CCD) and was crammed with even more megapixels (14.7) than its predecessor, the G9. We all learned a long time ago that increasing the pixel count alone is not the answer to image quality. The size of the pixels, as well as the processing engine, among other things, are even more important. In fact, many of us have become annoyed with the megapixel race, because, although it may be a good marketing tool for selling cameras to those who do not know any better, it does not answer the image quality concerns of the serious photographer. Has Canon found a way to get that DSLR image quality out of a small sensor with so many pixels? I have been using a Canon G9 (12 megapixels) for some time, and I think that, for me, it has been the best choice as an "all around" point and shoot camera. The G9 is responsive enough and compact enough. The photos from the G9 are detailed and technically quite good, but its image quality paled in comparison to that of my DSLRs. The quality problem seems to be at the pixel level and can easily be seen on screen. Pixels just look mushy or muddy and the images don’t pop the way those from my Canon 5D do. Even RAW files look slightly processed at higher magnification. Prints look pretty good, but I am still not satisfied. I also used a Sigma DP1 for a while. Unlike the G9, it has a much bigger sensor (APS-C size) and it shows. The image quality is quite spectacular at times, but inconsistent. I liked the DP1 at first, but I eventually stopped using it because it was too slow and I was missing too many shots. The Canon G10 is a solidly built camera. It feels good and looks good. It does not exhibit much fluff. It is meant for business. It is quiet and goes almost unnoticed in a crowd of people. These are all things that will make it attractive as a serious tool for serious photographers. The G10 starts up quickly and is fairly responsive. Shutter lag is minimal. Focusing sometimes takes a little longer than I would like, but pre-focusing is possible by depressing the shutter button half way. If I miss a shot, it is rarely the G10’s fault. The image stabilization works well. The maximum shutter speed has increased to 1/4000 from the G9’s 1/2500. The battery is bigger than in the G9, and I can shoot all day without charging. 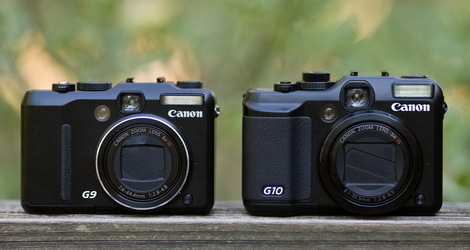 The G10 is noticeably bigger and heavier than the G9, even though their size specifications do not appear all that different. It is easily carried, though, and with a wrist strap (rather than the neck strap it comes with), it still fits easily in a jacket or coat pocket, but not in your shirt. I really like the layout of the controls on the G10. I rarely have to use the menu while shooting. The ISO wheel is now under the Mode Wheel and there is an Exposure Compensation Wheel where the ISO wheel is on the G9. I use exposure compensation all the time now because it is so easy to get to. There are two programmable Custom Modes that are selected with the Mode Wheel and there is a Programmable Button on the back. The LCD has gone from 230,000 pixels to 416,000 pixels and is now useful for checking focus. I wish it would flip out. Another change from the G9 is the lens. It has a shorter maximum focal length, but gets wider. Instead of the G9’s 35mm to 210mm (equivalent) lens, it has a 28mm to 140mm (equivalent) lens. The wider angle is frequently appreciated, and I rarely miss the longer telephoto on the G9. Its maximum aperture is ƒ/2.8 but it shuts down to ƒ/4.5 at full telephoto. Minimum aperture is only ƒ/8, so there is a neutral density filter that adds an additional 3 stops of light intensity reduction. I am pleased with the lens overall. It is sharp, has minimal distortion, and has almost no purple fringing. I usually shoot RAW. I am not a big fan of Photo Professional (Canon’s RAW software). The G10 is not currently supported by ACR and this makes evaluation of image quality a little tougher. However, it is easy to see that Canon has done something amazing with all those pixels it crammed into that small sensor. In a well lit, well exposed photo taken at low ISO, the image quality is so good that I was caught off guard. I kept checking to make sure I was looking at the photos from the G10 and not my 5D or 1Ds. 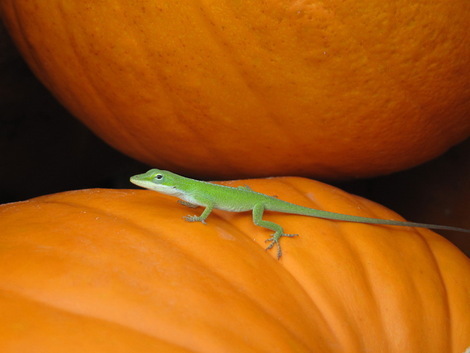 The images have plenty of detail, nice saturation, and definite "cropability." Even blown up to ridiculous proportions, the pixels are not so mushy. The photos also hold up well in post-processing. In the past, if I took a great shot with a point and shoot camera, I would always wish I had taken it with a DSLR instead, because I was sure the shot would have looked that much better. I am not so sure anymore. I no longer regret having used the G10 instead of my 5D. The image quality is that good. There must be a catch, you say. Well, unfortunately there is. Under less than perfect conditions the G10 behaves more like the G9 and other small cameras. It is not as good as a DSLR with regard to low light performance, as the image quality deteriorates at higher ISOs. Shadow detail is not as good as it is in a DSLR, either. I should point out, though, that as an enthusiast, I am being a tough critic. The image quality may not quite match the 5D, but your average point and shooter would rarely find fault with the images from the G10. Only my photographer friends, after a careful look, could really differentiate the files from the G10 and the 5D. Even in less than ideal conditions, the images from the G10 are still pretty darned good. For the last 6 months, the Sigma DP1 has been the gold standard for image quality in a pocketable camera. Even though I still like the images from the Sigma DP1 better for overall look, the significant resolution advantage of the G10 is hard to ignore. Lately, there has been a lot of talk about convergence between still and video photography. I think many point-and-shooters have always appreciated the fact that they could capture a small video clip with their camera. After all, these cameras are mostly used to document family or personal experiences rather than to create fine art. Canon’s new 5D mark II has some amazing video capabilities, and I would have expected this trend to show up in all of Canon’s newer cameras. I was disappointed to find that the G10 no longer shoots "HD" video. The G9 could shoot video at 1024 x 768 pixels at 15 fps. The G10 shoots a maximum 640 x 480 pixels at 30fps. The G10 does not have the G9’s time lapse options either. In other words, it has fewer video options than the G9. I think Canon really blew it here, as any form of solid HD video capability would have been a strong selling point for a camera such as this. There has been a lot of activity lately in the DMD arena. The new Micro Four Thirds systems seem really promising with small size cameras, larger sensors, and interchangeable lenses. Also, Sigma has announced that there will be a DP2. Is the G10 a DMD? It does not fulfill all of Mike’s requirements, but it's getting close in many ways. Perhaps it depends on the needs of the photographer using it. Canon has now demonstrated that a small camera with a small sensor can provide the ergonomics, speed, flexibility, and image quality that would please most serious photographers. Canon G10 at Amazon U.S.
Canon G10 at Amazon U.K. Featured Comment by Steve E. Miller: "Man, no timelapse? I have found that function is what I use my G9 for more than anything. Some pretty cool examples can be found from a shoot that I have done in the commentary on my flickr page for the Autumn Arts portfolio.... Thanks Mike!" "It is not as good as a DSLR with regard to low light performance, as the image quality deteriorates at higher ISOs. Shadow detail is not as good as it is in a DSLR, either." 1. At the lowest ISO setting, when the light is low (i.e. cloudy, near dark) performance suffers? 2. When "light is low", and the user increases the ISO, performance suffers? I too have a question for the reviewer. I own a G9 and love it, the low light capability is naff but then it's a small sensor camera so it's to be expected. My question is about the viewfinder. The one on the G9 is truly abysmal, what's the one on the G10 like, as I really like using a viewfinder for composition. Where does the IQ start to show weakness? ISO 200, 400, 800??? Thanks for a very useful review. 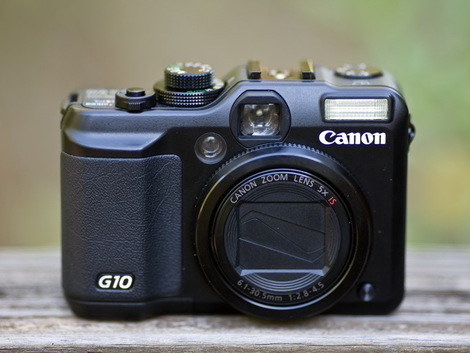 Ed, thanks for the Canon G10 review. But a question about the G10's IQ that needs to be answered, is, how large a print would you be satisfied with? Thanks for that review. I have wanted this camera for a long time now (ever since it was the G7). I recently purchased my first DSLR, so it will be a while before I can afford a quality P&S. I do miss the P&S style. Now, when I pull out my DSLR, people notice. Before I could take much better candid shots of people. Anyway, I appreciate the review and love this site. The biggest failing of my G9 is its pedestrian optical viewfinder, which only approximates the framed image. I'd like to know if the G10 optical finder is significantly improved in its accuracy. Crank up the G10 to ISO 1600, and see what happens. Yuck. I'm saving my ducats for the DP2. Thank you for this excellent "first impression" review, Edward. It's the best I've seen thus far. As a G9 owner, and previously a G7 owner, I was predictably drawn to the G10 immediately. But ultimately I decided to pass on it for three reasons. 2. IQ: I have had the opportunity to evaluate the G10's imaging performance. It's simply not better enough than the G9 to warrant the expense (and the added pocket load). That it's almost the same and perhaps slightly better in bright light as the G9's is actually quite a credit to Canon, since it packs 17% more pixels onto the same tiny 1/1.7" CCD as the G9's. 3. Responsiveness: My main bugaboo with the G9 has not been its image quality, which I've found to be excellent for its class. Nor has it specifically been its somewhat slow auto-focus time. Pre-focusing has long been my technique for these little cameras. Rather, it's been its shot-to-shot cycle time. It just takes too long for the camera, when recording RAW, to be ready for the next shot. (Using JPG recording cuts the lag a bit.) The only solution is to use continuous shooting mode, which really is not a good solution. My very brief evaluation of the G10 indicated no improvement in this attribute. If anything, it may actually be a bit slower. So my (only) 1-year-old G9 will remain my p&s camera for the foreseeable future. I'm not in the market but enjoyed reading your first hand account including the comparisons to the G9 which I have used a bit. I enjoy this sort of user review. The viewfinder on the G10 is about as bad as on the G9 in my opinion. The lens still blocks the view and I only use it when I have trouble seeing the LCD. Image quality is subjective and, again, ACR was not available. I also did not use any noise reduction. In my opinion you can make fine photographs with this camera. I made some great prints at 11x14, but did not try to make larger ones. I think much larger prints could be made with a low ISO, sharp, well exposed file. How much noise is tolerable is a subjective thing. I have a friend who is picky about many things, but feels the images he gets from his G9 up to ISO 400 are just great. I would not agree, so it comes down to tolerance. After all, we loved 35mm film, but looking back, there was a lot more noise than in many point and shoot images. I am sure there will be many articles to come that will go into great depth on this. My article was really a first impressions article. Well exposed, sharp images that do not have a lot of shadows, shot at ISO 80 or 100, are really hard to tell from a DSLR image. The farther you get away from that ideal, the more the G10 starts to act like other small sensor cameras. I can see a difference between ISO 80 and ISO 100. At ISO 200, noise would start to bother me a little. At ISO 400, I would be disappointed with most images, but they would still be usable. At ISO 800 and 1600 I would say that having an image is better than not having one, but only for documentation purposes. The more underexposed areas, the worse the noise. In low light, I think ISO 400 is OK, but I would only use higher ISO’s if it was the only way I could get a photo. The Sigma DP1 has better low light performance in my opinion. Again, I am very picky and critical of image quality. I am used to using a 5D or 1DsIII. Those are tough acts to follow. I like a “clean” look to my images out of my camera. If I want noise or special effects, I want to put it in the image in post processing. So, when I tell you that you can get excellent, usable images out of the G10, please believe me. Because of resolution and IQ, the G10 is a step up from the G9, and I am comfortable using it to get important photos. I just make sure to use it the way it works best. Common sense tells me it's the worst kind of camera. It is hard to ignore because it is small and light. Yet common sense tells me I am not going to be satisfied with the quality of the shot. And the quality of the shot is the reason I have a camera with me in the first place. Common sense tells me that with pixel density 12 times that of a low-end dSLR and a sensor one eighth the area, I am going to be struggling to capture an image at anything other than optimal conditions. But the G10 coos and says "look! I am small and light and my image quality is OK if you keep to low ISO. And you can tailor your shooting to keep to low ISO, can't you? And did I mention that I am small and light?" Well maybe, but I'll pass. Put a big sensor in it and give it a 12-60mm lens, and I'd think differently. Thanks for the review. Is the shutter-lag noticably closer to DSLRs than with previous models? Were you happy with the responsiveness? I don't regret noise all that much since I almost never used film higher than ISO 400 and the G9 gives me image stabilization and much higher depth of field at 2.8 so I feel like things are tolerable. But what really hate is that dreadful viewfinder. Is seems larger, but by how much ? Also, is dynamic range any better ? I wonder at the larger size of the body compared to the G9, perhaps an indication of larger sensors in the works for the G-series? This may be hinted at in an interview with canon's Masaya Maeda, "we're looking at the possibility of adding diversity to the G10, which would be the answer to those looking for something other than high megapixel count." *how fits the G10 in comparison to the G9 with the lensmategrip? *is the G10 viewfinder bigger compared to G9? *is imagequality really better compared to G9? *What about the lens? Is it "sharper" than the G9 lens? Sharp as a Ricoh Lens (GX range/GR range)? *Is this 14MP more prone to blown out highlights? *i have also seen G10 images that have purple fringing. *would you prefer the G10 over the G9 and why? *What about handling. 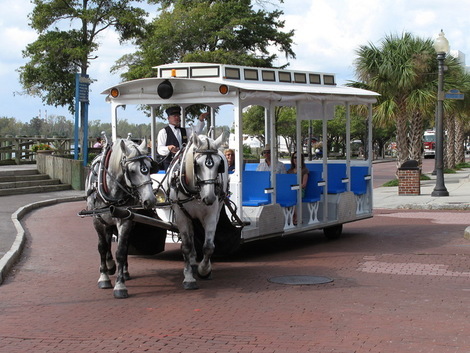 How easy is it to change Aperture, is there also the wheel on the backside. Is the EV-wheel to handle with the left hands thumb? For overall imaging results we have to wait a while until ACR/Lightroom or Silkypix will handle G10 RAW files. I hope to make a test of the G10 when it will arrive in our shop. Would you be able to compare the G10 to the new Lumix LX3 (which is supposed to be just like the latest Leica D-Lux)? Its 24-60mm/f2.0-2.8 Leica lens looks really good! "Well maybe, but I'll pass. Put a big sensor in it and give it a 12-60mm lens, and I'd think differently." "But what really hate is that dreadful viewfinder". Pretty much sums it up for me, i guess. For the mini-sensor/compact thing, I have gotten spoiled by the s6000fd, and the F20 (drat, no viewfinder!). Yesterday i have tested the LX 3 in RAW and JPG mode. I've developed the RAW with Silkypix Developer Studio Fullversion [not with the bypacked SE Version]. Very good lens, very sharp [still not razor sharp as a Ricoh one]. Less purple fringing. A really enjoyable Display, full 24mm in 3:2(so the LX3 and D-Lux4 are the only compacts that record in the most preferred aspect ratio by full focal lenght! )and 16:19. What i've found, is that in 24mm when photographing a buildings front, you will see barrel distortion in the middle. It has also a very good Dynamic Range function. As expected, Noise is ok up to ISO 400, from ISO 800 you have to tune up with your preferred Noiseware. I am not satisfied with the quality of the Joystick use to change Aperture, Time, EV, feels a bit too flimsy, but it works. As i talked to Leica at Photokina, the change over Lumix LX 3 is that the Sensor of the D-Lux 4 is measured in by Capture One. I think this is no matter when shooting RAW, just a matter for the JPG engine. The JPG engine of the Lumix Cameras is known to be a bit too aggressive, so on the LX 3 it is, no wonder, too. It is useful (and possible) to change the sharpness, contrast, saturation settings downwards.....I will look over the D-Lux 4 when i can get one for testing. As an owner of the LX3, the G10 seems to be a bit of a different beast, for a different user group. For me, the 24 mm f/2.0 wide lens has been a revelation, as well as the class-leading high-ISO performance. Also, there is so much to finetune in the settings the possibilities for tinkering seem to be endless. But I would guess the G10 is also a seriously good photography tool. Interesting that the LX3 should come up (I was just going through some of my shots from mine). IMO, The biggest differentiator between the LX3 and the G10 is size: in comparison, the Canon is a brick. this was what ruled out the G10 (and G9 before it) for me. I have noticed a lot of edge barrel distortion on the G9 at least on macros. How does the G10 compare? You can complain all you want about the size of the G9 (or G10, as the case may be). For me, it was one of the attractions of what I think is a great little camera to take everywhere. You want something that fits in your shirt? Use a camera phone. But when you drop it on the street while out walking, let me know if it holds up as well as my G9 did after I dropped it. Small scratch on the bottom, otherwise sharp as a tack. Seriously, when are people going to start calling a spade a spade and realize you aren't going to get D3 quality in something the size of a walkman? Cheers for the follow-up Ed. I was so hoping the viewfinder would be better, oh well. I'll stick with the G9 I think, until something better comes along. 1.It's bigger than the G9 (which as my wife pointed out "needs big pockets"). 2. You can't use it in less than perfect light conditions (the quality is simply awful). 3. You have to stand with your arms out in front of you to shoot with the screen (the viewfinder is a waste of time). I love Canon cameras (have owned at least 9 in total) but they are forgetting the point of this one's purpose in life. yes, it's built like a brick...but for the money Canon are asking you should reasonably expect all-round performance to match. I can't help but notice that my review was a pretty positive one, but many of the comments about the G10 appear to be somewhat negative. I can understand this, as we all want a small camera that matches the IQ of a DSLR even at higher ISO's and has a great view finder to boot. Such a thing does not exist yet, though I am sure it will be coming along soon. The G10, though, is a usable alternative to a large camera in many settings. Like any tool, you have to know when and how to use it to get the results you want. The G10 will not always work for you, but it will work if you use it under the right conditions. Right now, I am out at night a lot, and my DSLR's can't handle that too well either. Even at noon, my DSLR often does not take great shots. Like many photographers, I have to wait for the light to be right to get my shot. Sometimes that is only an hour or two a day. I like portraits on the beach at sunrise or a landscape at sunset. Using a G10 or an LX3 or a DP1 is no different. If you use it under the right conditions, you will get satisfying images. For flexibility and IQ in a pocketable camera, there are only a few choices and the G10 is definitely one of the better choices. If you look around the blogosphere, you will learn that some very serious photographers were quite pleased with the G9 - and the G10 is a step up. The bottom line is that you can take amazing photos with the G10 that look very good even when printed fairly big. Even if I never changed the ISO from 80, it would still be a very useful camera. I could go on and on about this, but the best camera is the one you have with you, and if you reject small cameras because they are not good enough yet, you are missing a lot of good shots. The fact is, that with some limitations, compact cameras are good enough now to do serious work. The G10, the LX3, the DP1 and several others are worth consideration now. In the near future, we should see smaller SLR's and other compacts with even better performance. It is an exciting time to be a photographer. "It's an expensive alternative to a pocket-camera which is supposed to be used when your DSLR is just going to get in the way. Now, this type of shooting invariably involves less-than-perfect light conditions." - Why do you say that? I do plenty of strenuous hikes in bright daylight... Everyone uses their camera differently, and I think there definitely is a market niche for the G10, even though there are (AFAIK) other high-end compacts with better low-light performance. I've made several 16x20 prints from my G9. Sure, they aren't as nice as what I'd get from my DSLR but I'm happy with the results. I recently enlarged some shots. Framed and hung on a wall and they look very nice indeed. Hi, Thanks for a good user-based review. I have been using a G9 for just under a year now and, looking at the comments, will not upgrade to the G10 as the benefits vs price do not seem to be there. I had my first G9 stolen and, annoyingly, the optical viewfinder on the insurance replacement is rubbish, whilst the original was very clear. Any advice anyone? I do wish Canon and others would concentrate more on hi-ISO noise reduction rather than pixel count; I still happily use my D20 SLR to produce 20"x16" prints with no discernible problems! O.T. I just had a nice thought when shooting outdoors like soccer games or whatever, the Pentax 60-250mm + the LX3 (24-60) sounds like a pretty nice combination haha! Thanks for the nice user-review on the G10! Looks like a great camera! I've always wanted to get an SLR, and with a baby on the way I was going to get a 5D, but not sure I will use it fully. Friend recommended the G9 which I have borrowed. I'm playing around with it. I really like it; pics seem crisp. Seeing that the G10 is out, in a matter of weeks the G9 has dropped in price. Which is the better one to buy? Does the shutter speed increase in the G10? I've been trying to capture our active pets with the G9 and the pets are too quick for it! right to wait - the wider angle (28) is a major asset. zb > Are your pets in bright/well-lit places when you try to take photos of them? It might be too dark so the G9 will have to use a slower shutter speed. I think it's "fast" enough to take those action pet shots as I could do that with my old digicam, I just have to make sure it's bright enough or use flash. I dont really like using the flash, as I prefer the natural light. REVIEW: WIRELESS REMOTE for the Canon G10 Powershot! YES! Just tried out the Hähnel HWC433 wireless remote operate with my new Canon G10 Powershot. How'd it fare? In a word, BRILLIANTLY! There was no need to read the directions... just popped the supplied batteries (a pair of AAAs for the receiver and a tiny 12 V LR23A for the sender), set a matching code with the external switches on both units, switch on the receiver and I was good to go. The receiver dongle comes with two different short cables with business ends for Canon cameras. The G10 Powershot takes the mini stereo plug for its E3 remote socket. The receiver is featherlight so there's absolutely no strain on the camera's E3 socket. A gentle touch of the button on the sender unit puts the camera in focus mode, then depressing the button fully... VOILA'! You've got your snap. No more setting the self-timer and scrambling to get in the frame. AND...now I can put the camera on a tripod near our peanut bird feeder and snap away at the exotics that appear - rose-ringed parakeets (the size of parrots), great spotted woodpeckers, etc., not to mention our nocturnal vistors - the foxes. In short, I'M CHUFFED! I've see a couple of similar units out there (like the JCC WR-100) that will probably work equally well. GET ONE! They're super. Anyone wanting info on the Hähnel, you can write me at: johnwadelong@gmail.com - and I'll send you pics of the setup. Hi Ed - thanks for your review and follow up comments. Most interesting. From buying the G9 as a back up to the dSLR, it has now taken over as my primary camera. Quality is excellent - I always use a 550 flash with it, and once u get used to using the G9 with the external flash on board the handling is superb - and using the screen rather than view finder allows you to get shots from angles you would have difficulty in getting from a dSLR. I am now interested in getting the G10 as a replacement for my 40d. It looks like 1 of my main critisms of the G9 has been addressed by Canon - and that is the addition of the wide angle 24 mm lens, which was needed. Also the addition of the remote..... I am not sure if the increase in resolution is needed, as in RAW and JPeg I already get excellent results from G9. So its out with the dSLR on saturday for a christening!! I'm a hobbyist who owned an SLR long ago but in the digital age haven't yet coughed up the money for another. This point-and-shoot was a good compromise for me. I used to shoot grainy 400 ISO film back in the day, and I was pleasantly surprised to see how comparatively little noise this camera generated at that setting. Using noiseware afterward produces some very clear indoor shots, even in low light. Well, clear by my standards, anyway. Once I've used a digital SLR (some day! ), I may change my mind. But for now, I'm very pleased with this camera. speaking of time-lapse. Maybe there are ways to get around it )or the lack of it). One of them could be using a programmable remote. I wonder if CHDK could help put time-lapse back in the G10. That would make me consider selling my G9. Otherwise the G10 sounds pretty good. Very informative review, and, based on my experience, very accurate and balanced. Canon's G1 and G2 cameras convinced me to move from film (Canon EOS3) to digital when the 20D was released. I sold my EOS3 and fast primes and moved to the 20D with fast zooms (and a couple of primes). I have not looked back. I do not like to shoot with flash. The G1 and G2 were simply better than film in artificial light. At ISO 400 (their upper limit) color was better and easier to adjust, and noise was not much worse than ISO 400 film - maybe better. Some of my favorite shots were with the G1 and G2, and I revisit them as software advances and remain amazed at their quality for 3-4 megapixels - and the low cost. I moved to a 5D and and a 40D. I shoot a lot of indoor high school sports in ugly light. Needless to say, the 5D and 40D are amazing. My DSLRs intimidate many when I haul them out to shoot. I decided to try the G10 to solve that (and to save my neck and shoulder). I simply wanted to have a camera at hand. My first serious shots were during an intimate gathering at the haunted Buxton Inn, at night, under available light. The G10 worked. The photos were not the quality of the 5D, but the shooting experience and the quality was better because the G10 did not disrupt the group. For this type of "guerilla" shooting, it is worth the money. Make no mistake, the technical quality of the photos would have been much better with my 5D and 40D, but I would not have hauled them out in that setting, and having no photos would have been worse. The photos were much better than I could achieved on film. Two closing comments. First, keep in mind Moore's law that the number of transisters on a chip of a given size will double each two years. This applies to other components as well. See Wikepedia. Applying this to my 2001 G1 at about 4 megapixels would yield the equivalent of 32 megapixels by 2007. By these calculations, the G10 is behind Moore's law, or that Canon chose quality at the pixel level at the expense of slavish obedience to Moore's law. My experience at the Buxton Inn suggests that this may be the case. Second, megapixels matter if image quality is otherwise equal, and that appears to be the case for the G10. More megapixels permits better processing in today's software if image quality is otherwise equal in two cameras. I have not compared the G9 to the G10. Thus, I cannot say that the G10 is sufficiently better than the G9 to justify a G9 owner's purchasing a G10. For anyone else (including DSLR owners and non-RAW shooting digicam owners), it may be worth the price and learning curve. At the right time, it may be the right tool. As stated by others above the view finder leaves a lot to be desired. I have a question though. Anyone know if the Ricoh 28mm external finder would work on the G10? Have you any feeling as to the shapness of the G9 vs G10 lens? Do you feel one or the other lens is overall sharper? Thanks for any throughts on the matter. For anyone interested, I just came back from 2 weeks in France with a G10 that arrived just two days before the trip. I’m quite in agreement with Ed’s review but can add some other notes in random order. The viewfinder is awful. You can forget using it for anything more than making sure you’re pointing the camera in the right direction. I faintly recall from the manual that it has 75% coverage—end of story. The screen on the other hand is lovely. I got comments from everyone who saw it on how bright and clear it was. It’s heavier than the usual point and shoot but it handles comfortably. You won’t put it in a shirt pocket but a cargo pants pocket (provided it’s not set too low) is just dandy. A big coat pocket’s fine, too. Picture quality is splendid up to ISO 200. 400’s bearable with some light Noise Ninja work. 800 & 1600 are useless and worse than useless respectively. The F-stops aren’t specified in 35mm equivalents so my instincts were stymied regularly. Further the control dial for them is on the back of the camera which requires a change in hand position that is ungainly. In fact, although they’ve given real thought to direct access with ISO and exposure compensation dials and a few others the fact is the camera is just too small to manipulate fluidly unless you have hobbit hands. If they’d added another inch in width (not thickness) it would have made a huge difference in control use. I didn’t use raw at all, just jpeg, because the included software was slow and pokey and ACR doesn’t support this camera yet. In fact, I tended to use automatic settings often because I just wasn’t familiar enough with the camera to be quick. Looking over the 500 or so images I took the one thing that bothers me is blown highlights. White buildings on cloudy days are excessively smooth. Way too many options. They’ve clearly decided their audience is comprised of 12-year-old gadget fiends. What’s with all these “scene” options? By the time you’ve scrolled through all two hundred of them the picture’s gone. I’ve never used those things anyway but it’s a good sample of the rest of the firmware. That said, to my astonishment, the face recognition focus system works rather well. 14mp is too much. Yes, on low ISO shots it gives you wonderful cropping flexibility but I don’t crop all that often and many pictures have charm without millions of dots. It’s a great camera but I’ve a feeling it will take months to get comfortable with it. Thanks to Ed for the original review and everyone for the various subsequent comments. I tend to like Nikon SLRs and Canon point-and-shoots, not only digital, but going back into the late film era. RIP Herb Keppler, but I think the SLR era for non-pro users is coming to an end, what with chromatic aberration and dynamic range starting to be addressable by chips instead of lenses, and 20x zooms on point-and-shoots. A couple of years ago I got a Canon G7, hoping it was the breakthrough small-sensor camera that would finally let me abandon SLRs. Alas, no. The G7 had three serious flaws in comparison to an SLR. First, at high ISOs the picture quality suffered. By high, I mean anything greater than ISO 100. 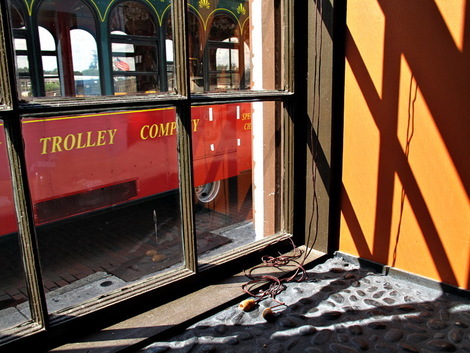 Sort of like working with Kodachrome 25 – if you want a quality image, use the low ISO. Second, the focus was just too slow and shutter lag too high. Third, Canon real-time flash is antediluvian compared to Nikon. I bought a Canon 220EX flash for the G7, thinking that would expedite things, but for some reason the Canon system takes a half-second or more to do a preflash and then trigger the shutter, whereas Nikon can do it in hundredths of a second, faster than human perception. I took the G7 and flash to a family reunion instead of an SLR, which turned out to be a mistake. The scenery shots were lovely, but the indoor people shots were totally random with huge shutter lag. I ended up trying to press the shutter a half second before I thought a useful picture might occur, with the sort of dismal results you can imagine. So the G7 went to my appreciative son and a Nikon D60 became my everyday camera. It is compact, lightweight, takes stunning pictures with the kit lens, and is the best SLR I ever had (F2, FE, FM2, N75, D50, D70s). But it is still too big and heavy to carry around when photography is not the prime focus of the day’s activities. I’ve been playing with the G10 for about a week. I think my expectations benefit from my experience with the G7. I take an SLR when indoor bounce flash is needed, or high ISO. I don’t expect short shutter lag except when things are ideal, but the G10 does seem quite a bit quicker than the G7. I am hoping that the i-Contrast function will add a little dynamic range, but haven’t done a serious trial of that. I leave it in P mode for the most part, or Av, and play a bit with exposure compensation. My C1 mode is set for slow-sync fill-flash at the Galen-Rowell-prescribed -4/3 stop, but just dialing the flash comp up and down seems about as easy and useful. So far, the test images are very pleasing. Get a fast memory card, the normal ones are too slow. Regarding cases: I had the official USA belt case for the G7. It looked nice sitting on a desk and protected the camera well, but sure was hard to use on a belt. I don’t understand some folks’ preoccupation with the classic rangefinder “easy access” neck-strap cases – to me they seem slow to use, obsolete and a bit twee. Must be a collector thing. I visited Best Buy and found a “Canon Deluxe Soft Case PSC-85”. This was not made for the G10, but it is an inexpensive end-access cordura belt case that fits tightly, with a Velcro flap holding the camera (no slow snaps or zippers). Easy in/out access and pretty good protection. I think we have gotten spoiled. Four years ago my favorite point-and-shoot-with-controls was a Leica Minilux, which had a truly fabulous lens. I could get very nice prints out of it, but as I think back, only if I sent the negatives to a serious lab. I had sort of forgotten how variable results were at my friendly local camera store or minilab. The G10 makes 8 x 10 prints that are just as nice, has a viewfinder that’s just as good (let alone the screen), better exposure metering, a zoom lens, much better battery life, is much smaller and lighter, has all four of the traditional exposure modes, white balance, and red-eye correction. RIP Minilux. It Amazes me how "professional Photographers" tear apart an awesome camera when they compare it to a DSLR!! Let's get one fact right out there.. THE G10 IS NOT A DSLR. It is a Sub $500.00 camera that offers full manual control, a hot shoe, an incredible form factor, ergonomics, and build quality. Comparing and pixel peeping to a Nikon D3, Canon 5D or any other DSLR is like comparing a Ferrari to a Camaro!! Of course the end result is going to be better!! It is what It is.. why do reviewers and comparison shoppers try to make it what it isn't??
" Oh I'd buy it if it was 2.0 with a 24-200 focal range with a sensor that is 3 times larger... Of course you would.. YOu would also pay two or three times the money.. quite possible more. I have the G10.. I also have the Panasonic LX-3, and a Canon 790, and a NIkon D200. Each camera has it's Pro's and Con's Likes and dislikes. If I want to toss something in my Pocket and sacrifice manual controls.. It's the Canon 790IS.. great for a party, ball game.. concert.. where you want your hands free. The Panasonic Lx-3.. I got it for my wife.. she likes Indoor shots, a perfect camera for indoors.. 24-60mm.. 2.0-2.8 (same price as the G10, neither is truly pocketable). It is what it is.. a great low light indoors or landscape camera. and sporting events. You just dont want to lug around lenses and A big DSLR.. all the time. so.. I hope I didn't digress too much..
can my D2oo come with me to Peru? Sure.. If i wanted to worry, carry, and torture myself all day. "THE G10 IS NOT A DSLR. It is a Sub $500.00 camera that offers full manual control, a hot shoe, an incredible form factor, ergonomics, and build quality. Comparing and pixel peeping to a Nikon D3, Canon 5D or any other DSLR is like comparing a Ferrari to a Camaro!! Of course the end result is going to be better!! It is what It is.. why do reviewers and comparison shoppers try to make it what it isn't??" I did see that.. Pixel peeping would reveal more.. But I won't go there. I guess my Point is.. the G10 is what it is at the price point it is at. If Canon went with a Bigger sensor.. faster lens.. etc.. it wouldn't be a G10 anymore.. It may become a DSLR.. costing much much more than it is. i bought G10 4 days ago, the best function is the remote capture, i connected it with my MacBook Pro, it's perfect for me to take 100 sunset photos by only pressing the release button once, simply, just like it. Comments from a mechanical engineer in the UK. First gotta agree with Calvin Smith, it ain't a DSLR, it ain't even trying to be one, what is it?, a great little camera I can stick in a small waterproof bag round my waist, put on my crash helmet and head off to the Lake District or North Wales for the day and come back after having a great ride with a bag full of excellent landscapes and no backache. For the record I've shot on all sorts of formats in film, but never owned a DSLR, I gave up with SLRs and long lenses at bike races, zoom in tight try to pan, miss another shot, better to zoom out a bit, get the shot then crop in tighter, sure you lose a little quality, but do you really notice (as long as you don't overdo it). I just wish peeps would take a real world attitude, does the camera work for what you want and give the quality you want, no, then you're looking at the wrong camera, go get a loan and buy a DSLR if it makes you feel better and leave us to get on with the job. As for video, what's the point compromising a stills camera so you can have a few extra features, I'm a photographer not a movie maker. If i set the G10 to 7-8MP (down form 14mp), will noise level go down as well? 50%? had there not been an LX3 and 1000D, G10 would have been the camera to get. unfortunately, LX3 and 1000D exist. these who say LX3 shouldnt be compared to G10, I ask why? you all want good low light performance, LX3 beats G10 nice and clean at ISO400. many of you want some quality movie recording, LX3 gives you 720P, G10 gives you non-wide screen 480P, a step back from G9. G10 is very comparable to LX3 and it loses badly in just about every category. the only thing it out does LX3 is reach and pixel count, quite frankly these two are actually trivial compared to its lacks. I say 1000D also kills G10 dead because for the price of G10, you can get 1000D with kit lens, it BEATS G10 even further in image quality test, yes it is big but so is G10. Lets just hope they do G11 with 10mp, 18mm lens and F1.8, and by the time G11 is to come out, it better have 1080P. I'm not sure I understand some of these arguments. I mean if I want quality I'll shoot sheet film. If I want quality and portability I'll use my EOS 5D. What I'm looking for is what I miss of the old days shooting with my Leica M6. I can't afford a digital M8. Yet I want a small unobtrusive camera to take along - a camera that doesn't scream, "HEY! Look at me! I have a CAMERA!!!" From what I've seen, the G10 just might be it. The photos I've seen are superb. Low light is lacking but it isn't THAT bad... I mean it is all about comprimises when you choose gear. Use the best tool for the job. I could care less about video. I am an artist not a photographer. What I like about the g9 and will like about the g10 is that it's small, gives me all the tools to be creative with out the fear of breaking it or not being able to make a decent sized print out of my shot. But hey I can take any pencil regardless of it's hardness and a simple piece of paper and make something awesome so... We can talk all day about how at the higer ISO's the camera doesn't perform as well as ball and chain dslr's it's not meant to compete with but at the end of the day, most of my favorite pictures aren't crisp, perfect, high-resolution shots. They are great observations by a person keen enough to notice. and argue that it is somewhat of a game changer. Yes, undesirable things do happen when the G10's ISO goes to 800 or 1600 (400 debatable, IMO). That said, I've been experimenting with Imagenomic Noiseware plugged into Photoshop, and have had some surprisingly good results. No, it can't create valid data where none exists, but it does a superb job of suppressing that high ISO noise that is the dark side of the G10. Why do people get so het up about poor results at ISO 400, 800 or higher? With a film camera you got good results with Kodachrome 25, or perhaps Kodachrome 64. Thus, if a small-sensor digital works OK at ISO 200, that sound OK to me. I could never use anything higher anyway. My first digital camera was a 4 megapixel Canon G3 which I purchased in 11/2002 It still works flawlessly, and use as my emergency backup camera in my car and boat. The G3 was top of the line at that time and cost $800. Then I complimented the G3 with a Canon XTi DSLR in 12/2006 for that same price, $800. Soon, I had to add the right set of lenses for speed, a Canon f2.8 17-55mm IS and range, Canon f/4-5.6 70-300mm IS USM for a total additional $1600 + hoods and filters. I love my XTi DSLR system as well, but it's quite a bit of weight,luggage and setup when I travel. I just got my G10 in 12/2008 for an amazing $400. My point is the Canon G10 is the best price/performer on today's market. With a little Lowepro Rezo 50 on my hip, the G10 has all the versatility for almost any camera condition. For those who think it's too big or heavy, compare to any DSLR or the older, bulkier Nikons, Olympus, or Cannon G series,some with no RAW format, resolution, or speed. Also, don't use the LCD for shots or slide shows. Use the eyepiece to save your battery. My only minor complaint is the relatively low resolution 640x480 pixel movie max mode which can freeze frames with audio advancing on playback with PCs, but hey, I didn't want to buy a camcorder either. I just have had it my new G10. After I found that the raw CR2 can be edited with Digital Photo Professional. I bought one and gave away my 8 months old G9 to my daughter. I am extremely disappointed with Canon this time. The team who design G10 must be blind. It is a big step backward from G9. So many features were taken away from G9 that renders G10 useless. People buy G9 for its versatility in photo and video. Without any improvement in photo capabilities, Canon takes away too many things from Video capabilities, such as time lapse video and optical zoom with video. Without these two features, G10 is useless. Anyone interested in my new G10. You will find it in eBay. I have just purchased the G10, in fact, it hasn't been delivered yet, but I am beginning to wonder from reading the comments, if I haven't made a mistake. I own a 5D and really love it: but when traveling, I find it difficult to carry around with me, especially with 2 or more lenses. However, thanks for your review of the G10. where is the HD video??? I'm almost crying.... Somebody knows if this "normal video.mov" is as good as the other...?